North of the Boodle car park, entering Daisy Nook Country Park, is a feature which was known as "Dark Tunnel." Originally this was actually a tunnel, but in the 1920s the tunnel was opened up to make a cutting following several roof collapses. In the Victorian times the eerie experience of walking through this tunnel was one of the amusements of the townspeople who flocked to Daisy Nook on Sundays. 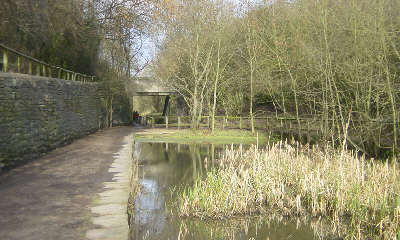 The towpath remains as a footpath into the Country Park, while the canal has now become a bridle path. 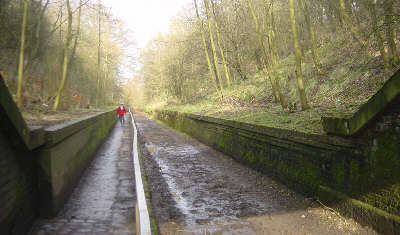 The former Dark Tunnel, Daisy Nook, opened out in the 1920s. 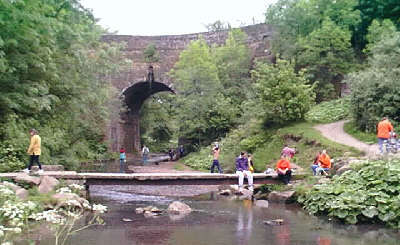 The canal next crosses the River Medlock by means of this impressively high stone aqueduct, named Waterhouses Aqueduct after the small village which was once alongside the river in Daisy Nook. 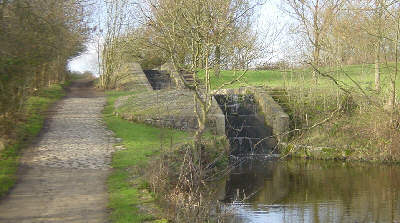 North of the Waterhouses aqueduct at Daisy Nook the Hollinwood Branch Canal climbed four locks. The first lock is just a few yards north of Waterhouses Aqueduct. 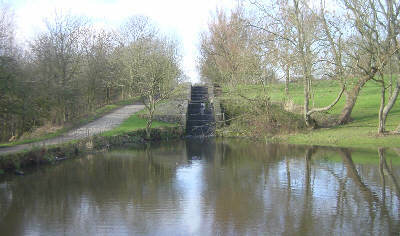 The second and third locks formed an unusual lock staircase, with three gates. On the hillside to the right was a pumping station, where a James Watt beam engine pumped water back up to the higher level. The lock staircase from the tow path..